Franco managed to snorkel with the Dugong for almost 40min! We often spot them from the boat when we are heading out for dives but they duck down pretty quickly as we pass. Underwater encounters with timid dugongs are very rare, so it was a special treat to spend so much time with one of these placid creatures. “It is not so much the photos but the experience that was so amazing,” Franco told us. 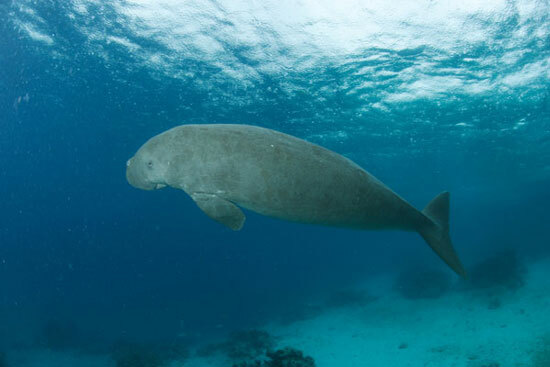 The Dugong or Sea Cow is a marine mammal occasionally spotted around the waters of PNG. Like whales, Dugongs evolved from terrestrial mammals which returned to the sea, possibly from the group that gave rise to elephants. Dugongs are an endangered species world wide. 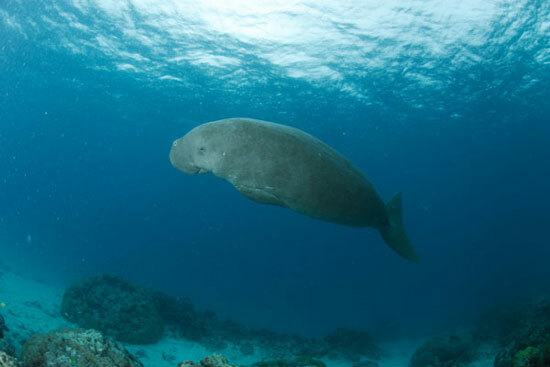 The waters around Kavieng feature submarine meadows of sea grasses where dugongs graze contentedly like giant sluggish underwater lawn mowers. Dugongs are the only herbivorous animals alive now that are completely marine. Once dugongs lived in herds of up to a hundred, but centuries of hunting has made them quite rare. Dugongs feed mainly on the more delicate and nutritious sea grasses, which they search out with sensory bristles on the upper lip. The lip itself is a versatile tool that digs out clumps of grass, roots and all, and carriers them to the mouth. Their teeth are surprisingly large for docile vegetarians. Fully grow, a dugong may be 3 metres long, and weigh over 300kg. Dugongs may live up to 75 years and mate for life. Franco Banfi resides in Lugano in southern Switzerland, and has been a professional photographer for over 15 years. His most notable major publications are two books on diving – Papua New Guinea and Dive Guide to Papua New Guinea – which he produced in 1996. 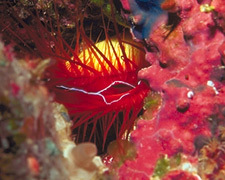 A friend, Simon Foale, introduced us to these fascinating little clams in the Solomon Islands. The clam needs to be illuminated to create this effect; the Brighter the light the more spectacular this lightning. A torch shone directly on the clam creates the most brilliant white sheet lightning effect. Abstract: Generation of the streak like flash in the inner fold of the mantle in Ctenoides ales was investigated by video camera recording, and stereo, light, fluorescence and electron microscopy. The stereo microscopy revealed the presence of a pale white band along the entire width of the marginal edge of the shell side surface of the inner fold. Since the flashing could not be seen in the dark, it was not due to the luminescence but the reflection of light… the electron dense vesicles packed in the cytoplasm function to reflect light strongly. The video observation showed that the mantle made a movement to roll the white band towards the shell side and then, within a second, the rolling movement was released. The phase of the movement was different by the portions of the mantle, and the mantle edge made a wave like motion. When the pale white band was hidden by the roll, the reflection of light disappeared. When the rolling was released, the reflection of light reappeared. Since the “roll and release movement” repeat quickly, it looks as though a streak like flash run along the mantle margin.